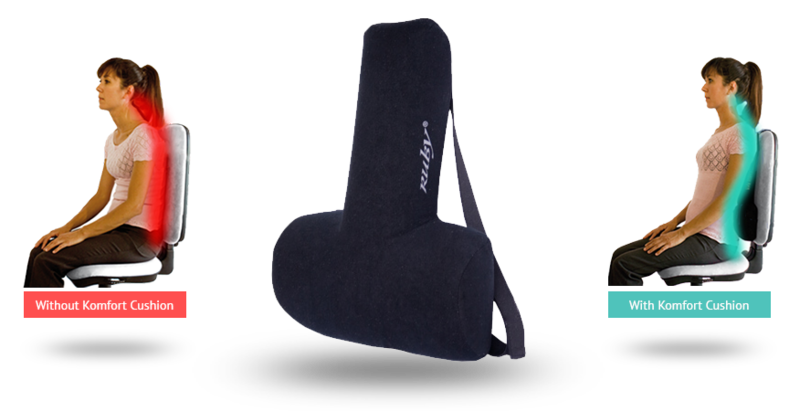 Improve your Posture and Get Rid of Back Pain with the new Orthopedic & Ergonomic Komfort Cushion. It is proven that subjects who maintain the sitting postures for long periods are one of the most exposed categories to the risk of back pain. In developed countries, 80% of workers suffer from muscle-skeletal pathologies, which are the first cause of absence from work. The most important benefit is precisely the constant distribution of pressure on your back muscles reinforcing them and ensuring a relaxing feeling. The pressure decrease between vertebrae gives you an immediate relief to your back muscles and prevents fatigue. By pushing the lumbar area upfront, Komfort Cushion reduces the compression over viscera and abdominal area eliminating the annoying feeling of indigestion, and abdominal heaviness. You will notice the difference especially after your lunch break. Thanks to its Ergonomic shape, Komfort Cushion opens the chest cage reducing the compression over viscera, promoting fluxes from the nervous, lymphatic and cardiac systems. Thanks to its action on the chest, the Cushion allows better breathing: blood and brain are greatly oxygenate and your work it will result less heavy. Komfort Cushion work for the recovery of normal spinal curves and the column alignment, restoring the correct posture also when standing or walking. For this reason our Cushion treats existing pathologies, but also prevents all those symptoms which make your working hours feel heavy and stressful time. Komfort Cushion can be placed anywhere you prefer: on your home chairs, at the office or on your car back seat, ensuring always a good posture in every moment of your day. Buy Today your Komfort Cushion or see what some of our Happy Customers say about Us.